A bridge damaged when a tanker carrying about 8,800 gallons of fuel crashed and burned on the 60 Freeway in Montebello will be replaced with a wider structure by June. Demolition on the damaged Paramount Boulevard bridge began earlier this week. Crews determined it could not be repaired after the Dec. 14 crash and fire beneath the bridge. 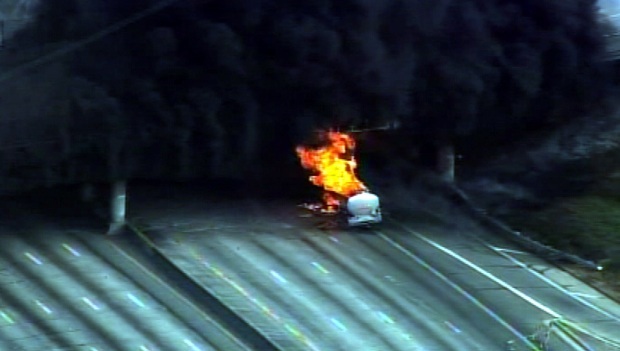 Concrete girders and columns were damaged by the fire, which sent black smoke over the freeway as the gasoline burned. 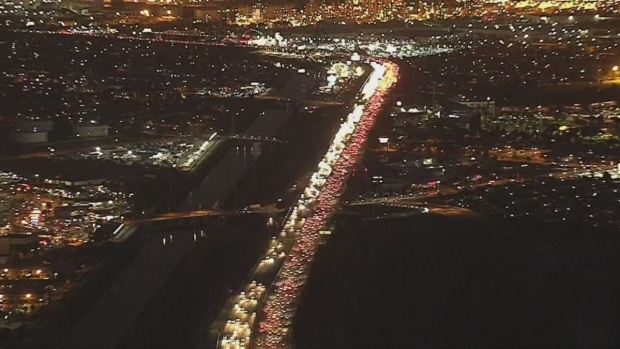 Portions of the 60 Freeway were closed for about three days after the crash. "It couldn't have come at a worse time," said Montebello Mayor Frank Gomez. The new bridge will be about 32 feet wider than the damaged overpass. That will allow crews to construct an additional northbound lane. The bridge will have sidewalks and a median. The project will mean ramp closures in the area during the summer travel season. "It is going to be a dangerous undertaking," said CHP Capt. Omar Watson. "We'll have officers out here securing the scene, but also making sure we don't have any issues of road rage."